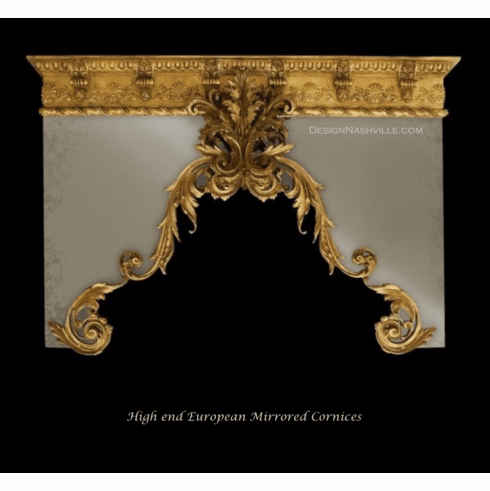 Hand crafted, opulent cornices feature ornate crown moulding, large scale flourishes, historical cartouche center, and mirrored glass face. Email Design Nashville to set up a time to talk by phone. Each element is hand crafted and finished in our small workshop. Numerous custom options are available. Four popular finish samples can be ordered here. The crown moulding in this example is 12" high, so the entire is more than 50" high. We can change the proportions to be as short as 30". Other mouldings can be used to change the style or proportions. European cornices ship via truck freight. Shipping cost is at minimum $250. White glove service may be available at additional cost. You may want to order finish samples of any of the four most popular finishes here. Copyright © 2007 Trends & Traditions All Rights Reserved.